If u have’nt read this book DO NOT read this becase i am spoiling the book for u. Hetty- i mean sapphire goes and works with an author and helps the cook and another maid Sarah,do there job. A boy in who works in the butchers dilivers food to the cook and is in love with Sapphire AKA Hetty but sapphire isn’t sure if she likes him, she thinks she is still in love with Jem. Then the master needs help for his book and Hetty gives him her memories which was a BIG no HUGE MISTAKE beacase when she wanted them back the master said no and she argued and he sacked her. So she goes to find her mum. When she found her she was sick so hetty took her to hospital unfortunatly her mum died a week later sapphire’s mum was talking to her in her head and said that her dad still lives. It sounded really good. That book is the only book I haven’t read in the series of Hetty Feather. It is really engaging and I really want to know what happens. If anybody has read all the Hetty Feather I recommend reading Diamond as Hetty Feather comes in to it! The book Sapphire Battersea is really enjoyable and sad so I reccoment it to every Jacky fan who loves some tissues beside them when reading books. Read it. 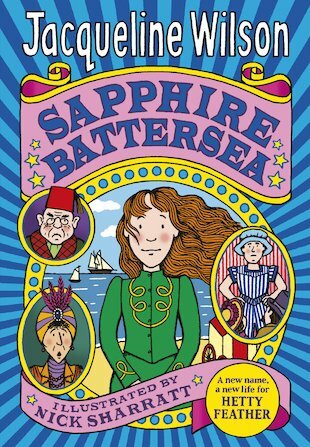 Sapphire Battersea is an amazing book just like Hetty Feather! It is definitely worth reading if you haven’t already because it’s very well written, keeps you hooked, uses lots of interesting vocabulary and much more! Sapphire battersea is a sad and heartfelt book but is also very exciting.